This project was created for the development team at BounceTribe; a web application that connects aspiring musicians to professionals in the music industry + allows musicians to upload tracks and receive in-progress feedback from peers and professionals. Before publically launching their site, BounceTribe wanted to know how well it worked for users. In order to assure the website was usable, my team evaluated its usability, identified key areas for improvement, and then compiled our findings and recommendations into a report. I worked on a team with three other UX-ers. The project was completed over a single week. We worked together on everything except for the final report, which we each compiled individually. Organizing findings from our evaluation of BounceTribe's existing website. View of BouceTribe's Dashboard upon login. Inviting friends to connect: there is no centralized location to add friends/tribe mates. Giving project feedback: posting comments and likes is not intuitive and the timestamped feature of comments it is not clear. There is no button to post comments, rather it happens (with minimal feedback) when you click off of the comment box. The meaning of words such as Bounce and Tribe are unclear, and might cause confusion. Informed by our website evaluation, we created a script for conducting usability tests. The script was written in a way that puts participants in the shoes of a potential user through contextual tasks or scenarios. We avoided using terminology specific to the website in order to best eliminate a biased framework. We orchestrated a total of 11 interviews consisting of both remote and in-lab testing. Each team member individually conducted two remote interviews. Our team conducted 3 in-lab interviews at Fathom Consulting. 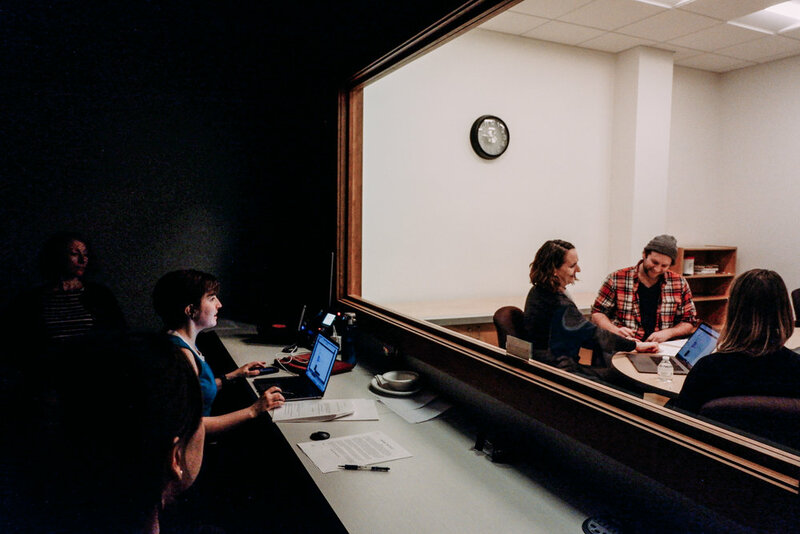 During testing, we had two team members in the room with the test participant—a moderator and a notetaker/observer—and two members observing on the other side of a two-way mirror—tech support and a second notetaker. The biggest issue we uncovered through emerging patterns among usability tests was that there is no clear, centralized location to search for and add friends. Adding friends by their username was especially difficult, and even when it was accomplished, it took users longer than necessary. Moving forward, I recommend creating a centralized, easily accessible location for users to search for friends as well as allow users to search for friends by first and last name. Low-fidelity wireframe of proposed changes to BouceTribe's dashboard, illustrating a centralized, easily accessible location for users to message and search for friends.